drums, krash boom bam, psychobilly, psychobilly drums, rockabilly, rockabilly drums, surf, surf drums, the kings of nuthin, liam crill, ringo starr, earl palmer, gene krupa, nick nicholls, eddie cochr | Krash Boom Bam!!! Well this about sums it all up! It just doesn’t get any better than this now does it! How come Los Straightjackets never play the beach near my house. Jimmy Smay shows what you can do with just a snare on a beach with a great surf band and a happy crowd. Jimmy Van Eaton was a member of Sun’s famed Little Green Men the backing band for Billy Lee Riley. He was the driving force behind on Flying Saucer Rock & Roll! Take it away Jimmy!!! What kind of set up are you using? I have a vintage Ludwig 1967 Black Marine 4 piece. 14” Snare, 13”inch Rack, 16” floor and 20” Kick. What do you use for heads, cymbals, sticks, kick pedal, snare? The Snare is a 1960 wood Ludwig. Remo Coated Ambassador Heads. Sticks are 7A, wood tipped. Pedal is a Vintage Speedking. Alright lets change things up a little bit, hailing from Budapest, Hungary we have the Naked Truckers Trio, who suprizingly enough aren’t scared to get naked to rock out. Nice solid playing from the Fox, both clothed and unclothed. Nice use of the maraca on the floor tom to drive it home.. I’ve used this technique a few times in the past, cool to see someone else bust it out… Take it away Fox!!!!! Straight outta Montreal Franck O’Brains kicks The Brains into high gear with Screaming. The Brains rip it up big time and Franck pounds the way. I’ve heard these guys are a blast live I can’t wait to check em out. The Ghastly Ones hail from Van Nuys, CA. Baron Shivers is the ghoul driving the kit with lightning snare fills. 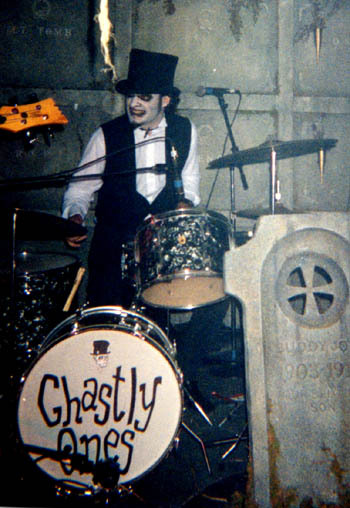 The Ghastly’s Ones have an old school surf-horror sound all of their own. They look like the house band for some of Vincent Prices wilder parties. Come on in and surf for a while? You are currently browsing the archives for the drums, krash boom bam, psychobilly, psychobilly drums, rockabilly, rockabilly drums, surf, surf drums, the kings of nuthin, liam crill, ringo starr, earl palmer, gene krupa, nick nicholls, eddie cochr category.